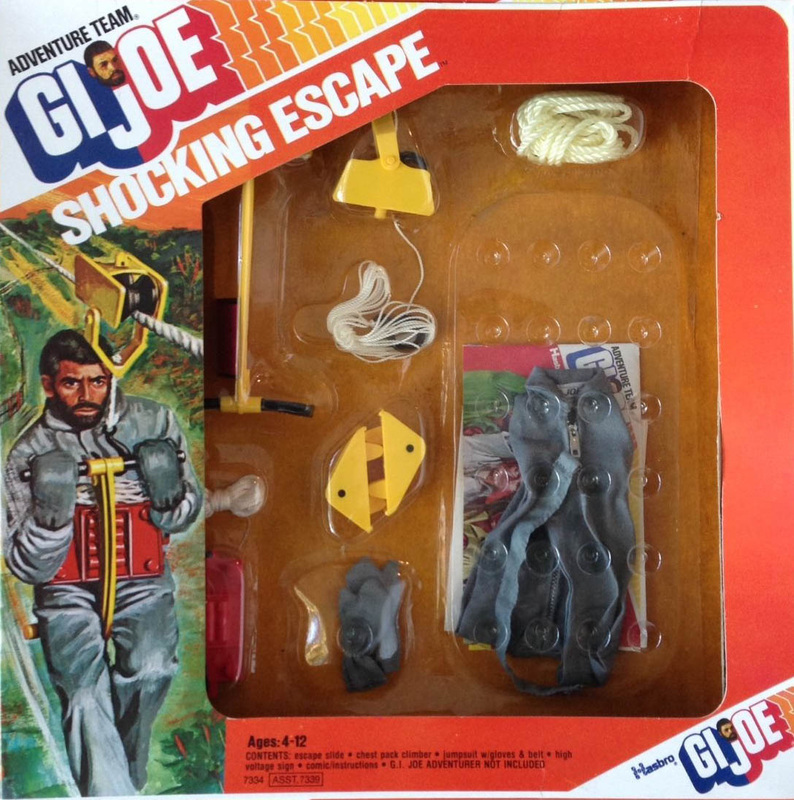 Simply put, the comic story that goes with Shocking Escape (7338-3) is the most ridiculous in the Adventure Team series. In it, a hydroelectric dam is assailed by deadly electric eels, and the only way for Joe to deal with the problem involves using a zip line. This was clearly a case, as I think is true for most of the 1975 sets, of Hasbro shoehorning existing accessories into different configurations to create "new" sets. This one includes a lightweight polyester jumpsuit with matching grey gloves, not to be confused with the heavier weight gloves from the 1967 Combat Construction set. There is also a yellow version of the Escape Slide, a belt, the climbing apparatus originally sold with Volcano Jumper now molded in red with a rubber belt, and a hot pink "Danger High Voltage" sign with typography borrowed from High Voltage Escape. Image of the tough to find box courtesy of eBay seller dswalters57. See their auctions here! Far left, the Shocking Escape danger sign, near left, the original version from High Voltage Escape.